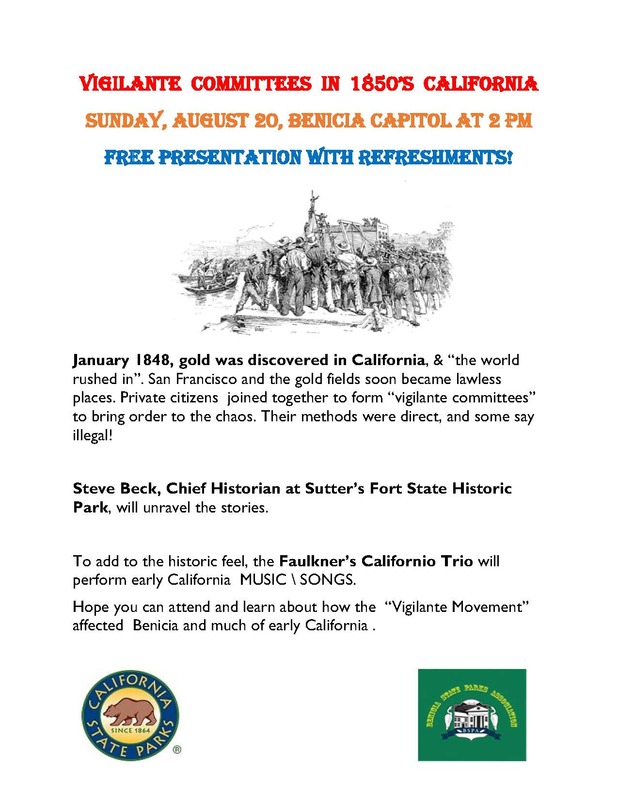 After the discovery of GOLD in January 1848 at Sutter’s Saw Mill on the American River , a whole lot of folks streamed into California ! By the early1850’s , chaos reigned in the Gold Fields and in the rapidly growing cities of California. San Francisco had two Vigilante Movements , in 1851 and 1856. Legal and illegal methods were used to stamp out the wave of arson fires, robberies and killings that plagued our beloved State. Regular law and order was not working, or was delayed because of wide spread corruption. Enter private citizens who took the law into their own hands. It was not strickly legal , but it did solve the problem , at least for a time. Some people were hanged , others sent to jail and even more were banished from cities and the state. Many of the Vigilants later rose to high offices in California. During this time Benicia and Napa had an on going dispute. Benicia was considered a Southern, pro-slavery town. The Benicia Barracks was home to many southern officers and soldiers. Napa was a anti-slavery town. Occasionally , this dispute resulted in ” Raids ” on each town. A few folks were ruffed up and some were killed ! So , if you are intirigued , come by the Capitol and get the scoop on this fascinating time. ” Vigilante Movement in 1850’s California “ . This Program is free and includes refreshments !